Winterland opens with the gangland-style murder of young Noel Rafferty in the beer garden of a Dublin pub. His family, including his aunts and one uncle, gather at his grief-stricken mother’s home to offer their support, though given his shady dealings in things criminal no one is terribly surprised that Noel’s life has ended in such a way. His youngest Aunt, Gina, was closer to him in age than she is to any of her siblings but she hardly ever saw her nephew, having grown weary of hearing about the trouble he has gotten into. However, when another member of the family dies on the same evening Gina starts to wonder if there isn’t something far more sinister at play. I loved the way the story is constructed. It’s almost more like a play in the way action moves from one setting to another. At the beginning of each set piece you think things are going to unfold in a particular way but Glynn manages to twist and turn things very cleverly so that virtually nothing you expect to happen eventuates, while surprises happen all the way along. Of course it doesn’t hurt that the entire story takes place against the backdrop of a very modern Ireland seemingly at the exact moment when the country’s status as the Celtic tiger of the world economy was coming grievously unstuck and those with any political clout at all were doing whatever it took to stay afloat. This gives the book both intensity and a truly contemporary feel. You really do feel like you might be reading the real story behind the news headlines. There are two main characters who carry the story and both of them are brilliantly drawn. Gina Rafferty becomes increasingly angry but she doesn’t automatically know how to channel her misgivings and rage so she makes mistakes, some of which are deadly. Her yearning to do the right thing by her family member is palpable though and she does not give up even when it seems like the only way to save her life. The other character who we see most of is Paddy Norton, a property developer and political player from the old days who is still playing puppet master to today’s political elite. His need to have things happen the way he wants them to drives everything he does and watching him deal with the fallout when things go awry is mesmerizing. There are other brilliant characters and enough stories within stories that a lesser writer would have lost several of the threads but Glynn holds this all together superbly. It is probably misleading to label this crime fiction as it has few of the conventions of the genre and, sadly enough, the label will turn some people off. This is one of those books that defies easy categorisation and is recommended to anyone who enjoys great writing, compelling story-telling and terrific characters. Winterland has been reviewed at Petrona and Reading Matters. Keishon at Just Another Crime Fiction Blog also discussed it last year after not finishing the book. Her post and the comments it generated also make terrific reading about the nature and value of book reviewing in the modern world. This entry was posted in Alan Glynn, book review, Ireland, Ireland Reading Challenge 2011. Bookmark the permalink. I plan to give it another go especially since you enjoyed. So glad you enjoyed this one, Bernadette. I liked it a lot, it made my “favourite reviewed book list” for last year. In retrospect, some months after reading it, I think the “cliffhanger” ending was weak, but the whole politico-business-building aspect was a big plus for me. I really liked the character of Gina too, I think she’s unusual in a crowded “cliche” market (like Ruth Galloway, in a very different way, is unusual). PS the person in Keishon’s comments (at your link in the post) who says book reviewing is dead nowadays – could not be more wrong! The (open) internet gives book reviewing a new lease of life, as we are not dependent on a few meagre inches of newspaper print – which in any case all review the same few titles. The internet (blogs, dedicated review websites, etc) is great for finding reviews of the books that appeal to one’s specialism(s), and for comparing different views of a book whenever the review was written. Bernadette – Thanks for such a terrific review! But I am not going to thank you for what this will do to my TBR! ;-). Seriously, I’m very glad you liked this one as much as you did and it’s now on not just my TBR, but my “You really must read this!” TBR. Okay, well you sold me (along with Maxine). I wasn’t sure about this one, but this pushed me over the cliff. To be added to the library TBR reserve list, when I have some room on it. Book reviewing is dead! I’ve never read so many reviews in one day (every day) as I do with the wonders that are the Internet, and the websites/blogs therein. In fact, it would take me 24/7 nonstop, with no sleep to read all that is posted, following every website link I see, with reviews and comments. It’s great, has expanded my reading like crazy, and increased my enjoyment, as well as keeping me up all night reading. And, buying, too, so booksellers should be thrilled. Sounds like a terrific read! I’ve added your review to the Ireland Challenge page. I agree with you on the crime fiction label. I was telling my husband that if she had joined forces with Noel’s old friend, the policeman, then it might have become a police procedural. Because she didn’t, it is plain and simple an excellent novel. I didn’t know it at the time you published this review, Bernadette….but Alan Glynn’s first book DARK FIELDS has just been released here in US as a movie “Limitless” starring Bradley Cooper. You liked this second book…so I just ordered the paperback from Amazon US. Thanks for the tip Jane, I’ll keep an eye out for the movie. I’ve also been looking for the first book but haven’t been able to track it down at a price I’m prepared to pay (Amazon shipping costs to Oz are brutal). Glynn is one to watch. I did read Dark Fields, which is called Limitless here, due to their changing the name for the movie. It’s a very different sort of book than Winterland. A touch of sci-fi in it. 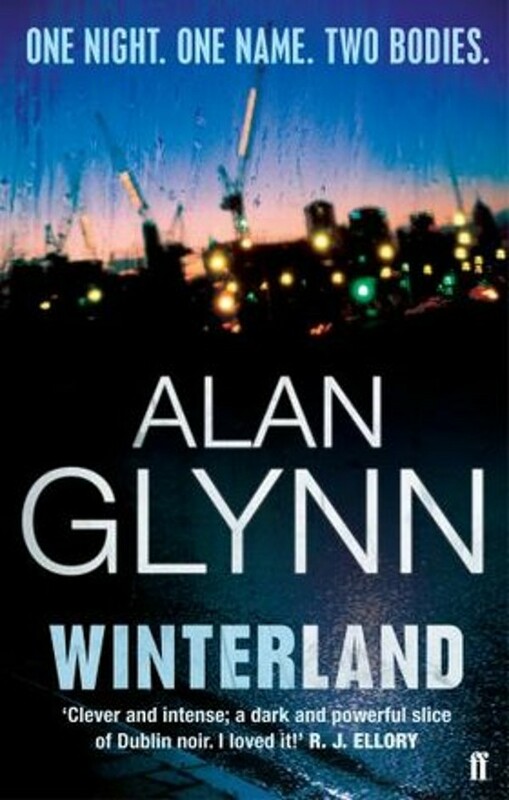 I think Winterland is more the direction Glynn is going for the future, as his next two novels, are Bloodland and something else -land. I read an interview with him where he said that the Irish financial collapse happened in the midst of his writing Winterland and made for some scrambling on his part .